In this case, the integral is independent of the path taken between the beginning and end points. However, not all line integrals are path independent. Indeed, there are two different classes of line integral--those whose values only depend on the end points, and those whose values depend both on the end points and the path taken between these points. 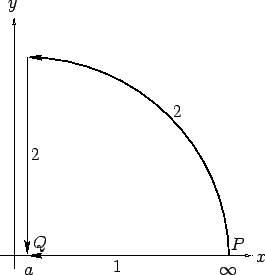 Figure 8: An example line integral.